Over the weekend of May 3, 2014, the College hosted the largest zero waste event in College of Charleston history. 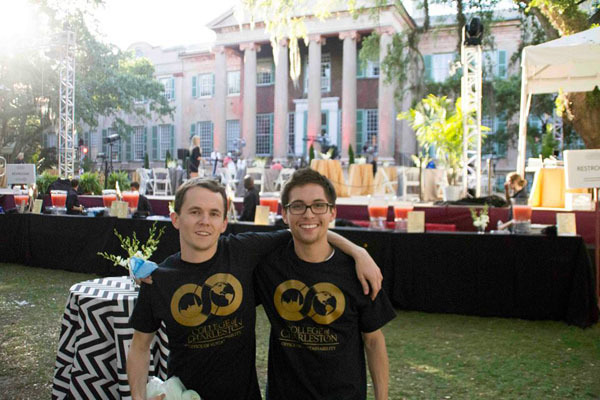 What began as an idea originated by the Office of Sustainability resulted in over 2,000 pounds of compost, 3,400 pounds of recycling and just 413 pounds of landfill waste generated during the annual A Charleston Affair (ACA) alumni event. The industry standard for zero waste requires that over 90% of total waste generated by the event be diverted from the landfill. In order to successfully facilitate the zero waste initiative, the Office of Sustainability worked with both on campus and off campus organizations including Alumni Relations, Physical Plant, Food Waste Disposal, Dining Services, Ice Box, JMC Charleston, and Charleston County. Jen Jones and Ashlyn Spilis-Hochschild set a goal of a zero waste ACA nearly two years ago. Once the College started composting with Food Waste Disposal at City Bistro, they knew that the College could begin accommodating composting at events. 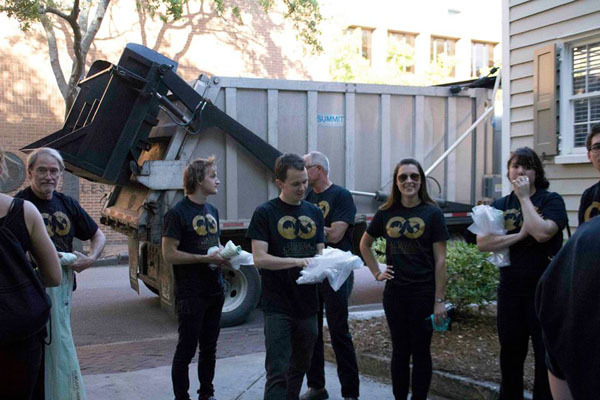 The Office of Sustainability hosted zero waste events during the 2013 Sustainability Week and at that point, they knew there was potential to compost at larger events. Composting expanded out to all other dining locations on campus and the College’s relationship with Food Waste Disposal continued to grow. Last fall, the Office of Sustainability started a “Sustainable Event Guide”. During the fall, Sustainability realized a zero waste ACA event could be a reality. At this point, Dining Services was already composting all of their pre-consumer (and most post-consumer) waste as well as purchasing all compostable service ware. In December 2013, Jen and Ashlyn were confident that Sustainability could work with Physical Plant, Dining Services, and Food Waste Disposal to do a zero waste ACA. They put together a proposal and pitched the idea to Alumni Relations in January 2014. Jen and Ashlyn worked with Jess Tuckman from Alumni Relations and addressed concerns they had with incorporating composting to the event. Alumni Relations approved the proposal in March 2014, allowing Sustainability to incorporate composting and increasing recycling efforts at ACA. One of the first obstacles faced after approval was that the compostable cups Sustainability wanted to use were not shatterproof, one of the requirements Ice Box had for the event. The Office ended up procuring recyclable, shatterproof cups, which made all streams recyclable (all drinks including drinking cups) and compostable (all food, service ware, cutlery). Another challenge was the number of volunteers needed each night. Beyond the Office of Sustainability interns, Jen and Ashlyn reached out to the College community and found volunteers from the Faculty/Staff Listerv, Masters of Environment Studies Program, students that work with the Sustainability office through the Garden Apprenticeship Program, and the Sustainable Greek Chair Program. Volunteers 21 or older were stationed inside and volunteers under 21 were stationed just outside of the event. The under 21 group opened each bag and made sure there was no contamination between streams of waste. Successfully achieving zero waste at ACA required planning, collaboration, and hard work. “I think it’s such a great step for the College and really embraces all of the components of sustainability–collaboration, hard work, dedication, adaptability–that I hope we can show that if it can be done at ACA, it can be done virtually anywhere on campus. Waste generated from an event shouldn’t be an afterthought; with planning and prioritizing, we can minimize the impact by changing what we perceive as waste to usable resources!” Ashlyn said. Jen and Ashlyn are excited about the potential for future zero waste events; they have already been approached by multiple people to pursue similar endeavors at their events.